I'm Rivanah Bannerjee, a young and independent girl living alone in Mumbai. My parents love me, my boyfriend adores me, and I have a great job. But here's the thing: my life is in danger. Someone's been following me around, watching my every move, trying to get control over my life. At first I thought it was a silly prank to gain my attention. My roomie suggested he must be a secret admirer. Is he? What he doesn't know is the police have set a trap to nab him. Soon I'll know if it's simply a lover's obsession or there is more to it. BTW, I call him Stranger. From the bestselling author of EX, How About A Sin Tonight?, That Kiss in the Rain and A Thing Beyond Forever comes a racy tale gravid with emotional twists, relationship quirks, and mind-numbing revelations. 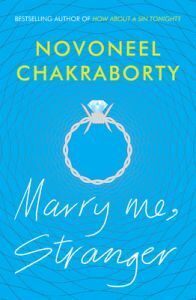 Novoneel Chakraborty is the author of four bestselling romantic thriller novels. He works in Indian television and films and lives in Mumbai.